We can store your products and deliver direct to your customers with our short and long term options. Need a consignment collected or delivered? Our quotation form instantly forwards to a trained member of staff. If you need to speak with us select the depot in the gold navigation bar above which is most relevant to your location. August 2012 was a landmark month for Barkley’s as we celebrated 50 years in business. 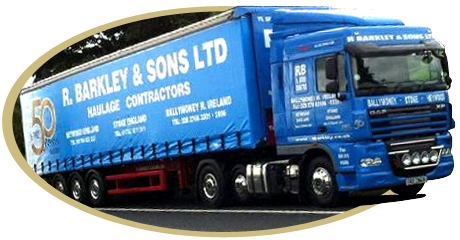 Boasting an impressive fleet of 45 units, over 100 various types of trailers, 61 employees & still staying true to our roots, as a family run haulage contractor. If you are looking for an efficient transport company that provides a great service on the UK – Ireland (north & south) route then you are in safe hands. We also provide a local service. Whatever your needs from a parcel to multi loads and ongoing contracts get in touch via the phone numbers above or request a quote online.